Electricity is a powerful source of energy, and its applications are innumerable. However, uncontrolled and unprotected electricity is very dangerous. Power overloads and short circuits may cause equipment damage, and sometime fire and human casualties. Therefore, it can be put to use for satisfying requirements only if we can control it and be safe. A variety of devices is used to ensure that an electrical system is controllable and secure. Switches are one such device used for controlling electricity. In an abstract way, we can say that both relay and circuit breakers are switches. A relay is a switching device used to control the path of electricity, hence controlling the circuit where electricity is directed to too. Instead of manually using switching a circuit on or off, a relay can be used to switch a circuit, and activate/deactivate among many connected to it, by controlling the current flow through an electromechanical assembly or a solid state circuit. The relay is controlled by a low power signal and assures complete electrical isolation between the controlled and control circuits. There are many types of relays exist, including Latching relay, Reed relay, Mercury-wetted relay, Polarized relay, Machine tool relay, Ratchet relay, Contactor relay, Solid-state relay, Solid state contactor relay, Buchholz relay, Forced-guided contacts relay, and Overload protection relay. The following factors are considered when selecting a relay for a circuit; number and type of contacts, contact sequence, voltage rating of contacts, coil current, switching time, assembly and mounting, radiation-resistance, and environment. A circuit breaker is an automatic switch, which is an on-load device, designed using electromechanical techniques to prevent power overload damage or short circuits. A circuit breaker has a solenoid inside, and it is kept at a certain voltage level, to keep the triggering mechanism in balance. Once a fault is observed in the circuit, such as an overload or a short circuit, the switch is triggered, and the current flow is discontinued. After solving the pertaining problem in the electrical system, the circuit breaker can be switched back to on again. Circuit breakers also come in many different sizes and packages, specialized to the requirements of the electrical system. At higher voltage levels, the circuit breaker mechanism may be immersed in an insulating material such as oil, to improve the performance. More advanced circuit breakers used in industry applications regulate interruptions by small inductive currents, capacitive switching, and asynchronous switching. They have a current and a voltage rating indicating maximum allowable current and voltage. • The relay is used for controlling a circuit with isolation between control circuit and the controlled circuit. Circuit breaker is used for disconnecting or isolating a circuit from the power source or a higher level circuit. • The relay operates on a low power voltage input while circuit breakers are automatic on-load devices. 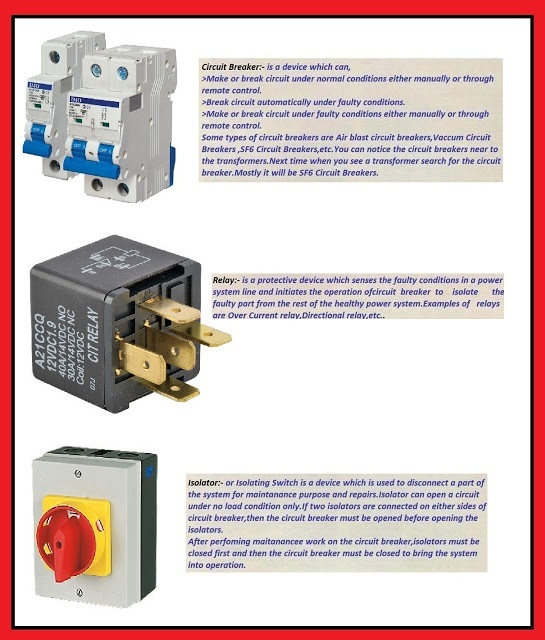 • Circuit breakers are used one per circuit while relays can be used to control/select one among many connected to it. • A relay may be included in a circuit breaker, but not the other way around. • A relay can also be considered as an electrical amplifier for discrete signals.